Please refer to our stock # B-19 when inquiring. 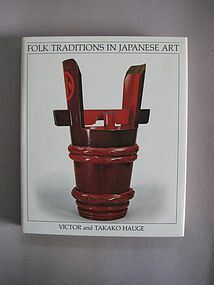 "Folk Traditions in Japanese Art" by Victor and Takako Hauge. 1978 First Edition, Kodansha. Clothbound Hard Cover with original dust jacket. 272 pages with 190 pages of color and B/W plates with full descriptions. Condition - New. "This book commemorates the first major traveling exhibition of objects drawn from Japan's great folk traditions. Representing major areas of Japanese folk arts - among them, textiles, ceramics, lacquerware, bamboo objects, furniture, and religious objects - this book captures their beauty, vitality and charm, illuminates the history and daily life of ordinary Japanese people, and broadens one's perceptions of the role of folk traditions in Japanese art. The objects assembled here, largely dating from the period of 1600 to 1930, are drawn from art museums, general collections of folkcrafts, ethnographic and specialized collections, as well as private holdings."